Sgt. Andrew Lackenby, RAFVR 941667 – Flight Engineer. Lost without trace age 32 on the 6th of July 1943. Son of W. H. and Mabel May Lackenby, of Wallsend-On-Tyne, Northumberland. Grave location – Panel 156. Four aircraft were detailed to carry out the above operation with mines of 1,500lbs., One aircraft failed to return, but the remainder successfully dropped their mines in the allotted area and the parachutes were seen to open. No. A.A. fire or searchlights were encountered. One unidentified aircraft was seen but no combat took place. The weather was clear and visibility was good. Navigation was very good. The missing aircraft was Stirling Mk.III EF436 captained by Sgt. R. Thomas. Sgt. Raymond Thomas, RNZAF NZ40586 – Pilot. Sgt. William Edward Stobbs, RAFVR 658070 – Navigator. Sgt. Douglas Arthur Allen Tayler, RAFVR 1321755 – Air Bomber. Sgt. John Bernard McLoughlin, RAFVR 126086 – Wireless Operator. Sgt. Cyril James Moore, RAAF AUS.410555 – Mid Upper Gunner. Sgt. Leslie Owen Lewington, RAFVR 1153956 – Rear Gunner. Stirling Mk.III EF436 AA-A was believed to have been shot down by a night-fighter, crashing into the sea some 12 miles North West of Terscherlling Is, the centre island of the Southern Frisian Group, at approximately 02.31hrs. All on board perished, and are commemorated on the Runnymede Memorial. Killed age 19 on the 4th of October 1943. Son of Sydney and Elizabeth Hall Lackenby, of Felling, Co. Durham. Sgt. Erwin Henry Reubin Lamb, RNZAF NZ413709 – Air Bomber. Lost without trace age 29 on the 5th of May 1943. Son of Reubin David Haigh Lamb and Mary Minnie Lamb, of Lyall Bay, Wellington, New Zealand. Sgt. Reginald Francis Westwood, RAAF AUS.416471 – Pilot. Sgt. Robert Henry Waldron Bentley, RNZAF NZ414580 – Navigator. Sgt. William Harkness, RAFVR 1127681 – Wireless Operator. Sgt. Frederick Horace Bennetton, RAFVR 1281626 – Flight Engineer. Sgt. Gilbert Humphreys Rogers, RAFVR 1382746 – Mid Upper Gunner. Sgt. John McLaren Boswell, RNZAF NZ414491 – Rear Gunner. Stirling Mk.I EF430 AA-Q was engaged by AA fire while transiting the Dutch coastal area and was brought down in the Waddenzee, South East of Vlieland, at 01:15hrs. None of the crew survived. All are commemorated on the Runnymede Memorial. 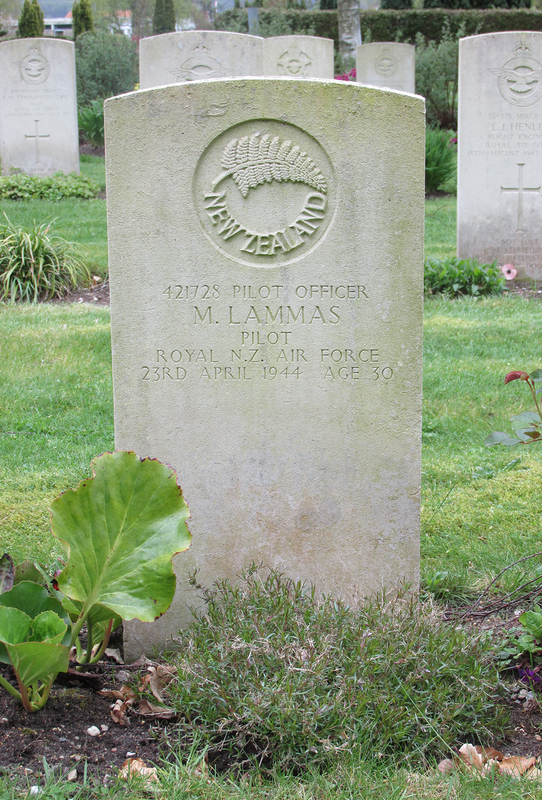 P/O Mauson Lammas, RNZAF NZ421728 – Pilot. Killed age 30 on the 23rd of April 1944. Son of James Arthur Young Lammas and Aimee Sophie Lammas; Husband of Rose Lammas, of Karamu, Auckland, New Zealand. Lost without trace age 32 on the 21st of July 1944. Son of Thomas William and Esther Lang; husband of Edith Lang, of Streatham, London. Grave location – Panel 233. Son of Frederick Walter and Charlotte Emma Larkin, of Kilburn, Middlesex. Sgt. 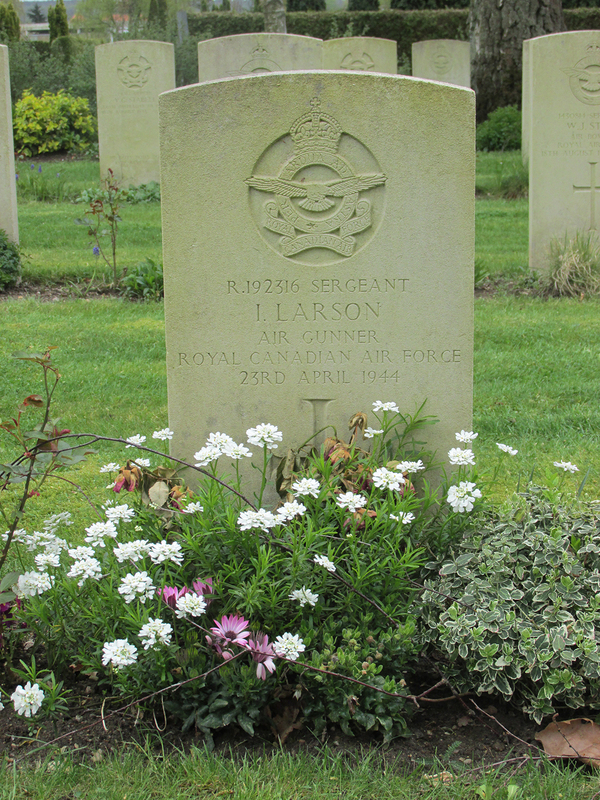 Ivar Larson, RCAF 192316 – Rear Gunner. Killed age 33 on the 23rd of April 1944. S/Ldr. Ronald Hugh Laud, RAF 40625 – Pilot. Killed age 27 on the 12th of June 1943. Son of Norman Charles and Mabel Laud, of Auckland City, New Zealand; Husband of Doris Laud (Nee Wilson), of Campbell’S Bay, Auckland. Grave location – 9. D. 1. Sixteen aircraft were detailed to attack the above targets with bombs of 2,000lb.,1,000lb. and incendiaries of 30lb. and 4lb. One aircraft failed to return and two returned early owing to engine trouble. The remainder of the aircraft successfully dropped their bombs in the target area. Many large fires and huge explosions were seen. Moderate and heavy A.A.fire co-operating with search lights were encountered. One aircraft was coned by searchlights, but violent evasive action eventually avoided them with difficulty. Some enemy aircraft were seen and two short combats took place, but no damage was sustained by our aircraft. The weather was clear and the visibility was good except for haze caused by the fires. Navigation was very good. The missing aircraft was Stiring Mk.III BK817 captained by Squadron Leader R.H. Laud, (“A” Flight Commander). S/L Ronald Hugh Laud, RAF 40625 – Pilot. Sgt. John Herbert Russell, RAFVR 1338131 – 2nd Pilot. Sgt. Hugh Steel McQuade, RAFVR 1349542) – Navigator. Sgt. Henry Stephen Mulholland, RAFVR 1332768 – Air Bomber. Sgt. Thomas, Whatmough, RAFVR 1059932 – Wireless Operator. Sgt. Aubrey Reginald Waite, RAFVR 575638 – Flight Engineer. Sgt. Frederick John Hawkins, RAFVR 1299618 – Mid Upper Gunner. Sgt. M.K. Matthews, RAFVR 848364 – Rear Gunner. Stirling Mk.III BK817 AA-B was shot down en route to the target at 01:35hrs by a night-fighter (Oblt Wilhelm Telge, Stab II/ NJG1), crashing at Frodthier (Liège), 6 miles North of Verviers, Belgium. 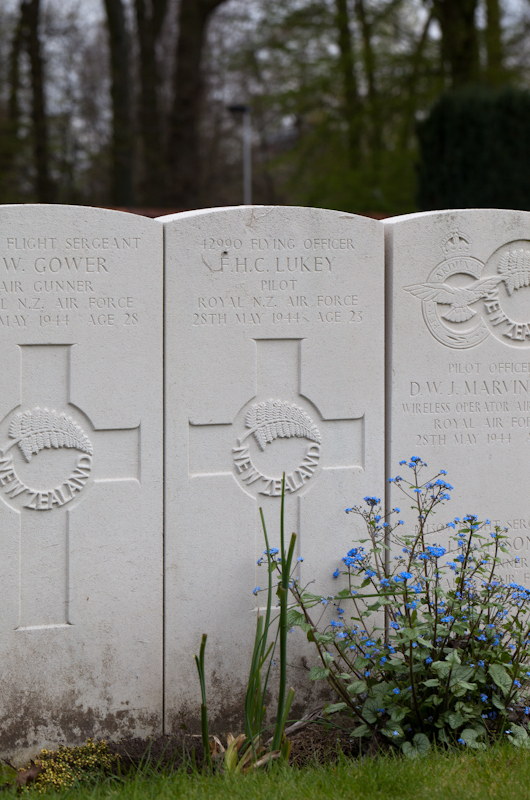 All but the Rear Gunner died and they are buried at Heverlee War Cemetery. Sgt Matthews survived and was taken as a POW. F/S William Wilfred Henry Lavers, RCAF 83468 – Front Gunner. Lost without trace age 23 on the 10th of September 1942. Son of Mr. and Mrs. Henry Lavers; Husband of Marie D. Lavers, of Sarnia, Ontario, Canada. Grave location – Panel 105. Killed age 21 on the 4th of September 1942. Son of William Law, and of Millicent Law, of Deepdale, Lancashire. Grave location – 3. B. 2. It seems likely X.3396and it’s crew were victims of enemy night fighter action. Sgt. 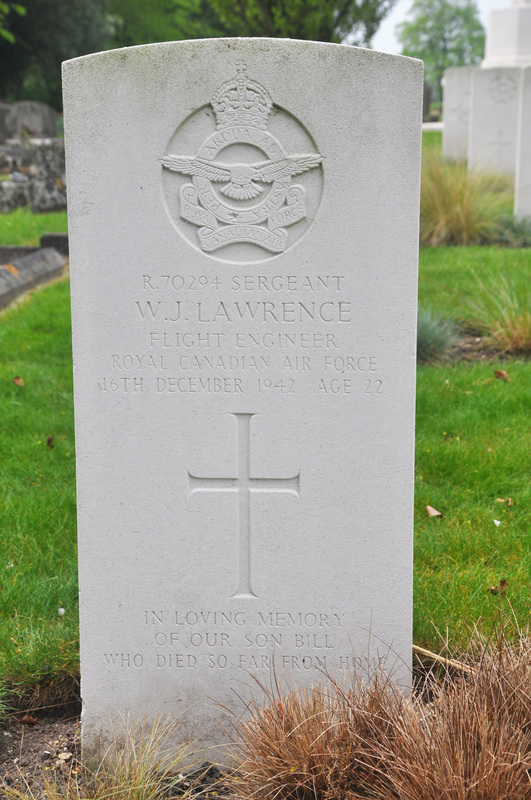 William Joseph Lawrence, RCAF 70294 – Flight Engineer. Killed age 22 on the 16th of December 1942. Son of Joseph and Edith Lawrence, of Oakville, Ontario, Canada. Grave location – Plot P. Grave 449. Son of Frederick George Lea and of Irene Lea (nee Lavender), of Watford, Hertfordshire; husband of Joan Annette Lea, of Watford. Lost without trace age 24 on the 14th of July 1941. Grave location – Panel 33. Lost without trace age 25 on the 1st of January 1945. Son of Alice Lee, of Fagley, Yorkshire; Husband of Dorothy Alice Lee, of Little Massingham, Norfolk. Grave location – Panel 271. Sgt. Reginald George Arthur Lee, RAFVR 1218848 – Observer. Son of Reginald Daniel and Daisy Lee, of Grimsby, Lincolnshire. Grave location – Joint grave 9. K. 21-22. Lost without trace age 21 on the 10th of September 1942. Son of James and A.C. Lees, of Oldham, Lancashire. Grave location – Panel 88. P/O Reginald Sidney Lees, RNZAF NZ404907 – Observer. Killed age 26 on the 27th of July 1942. Son of William John Lees and of Harriet Lees (Nee Burt), of Matata, Auckland, New Zealand. Buried Sage War Cemetery, Germany.. Grave location – 13. C. 8. P/O Ian James Shepherd, RNZAF NZ404414 – Pilot. P/O Norman Bruce Robertson, RNZAF NZ411101 – Wireless Operator. Sgt. James Francis Winstanley, RNZAF NZ412373 – Front Gunner. Sgt. Dixon J, RAFVR 613966 – Rear Gunner. Wellington Mk.III Z.1596 AA-K was shot down by AA fire when flying away from the target at low altitude. After dropping its bombs the aircraft was ‘coned’ by searchlights and the pilot carried out a steep dive to escape the beams, levelling out at approximately 500ft but still in the midst of heavy light flak. The aircraft crashed near the village of Dose and all but the Rear Gunner, Sgt Dixon, who survived the crash relatively uninjured, were killed. Dixon was taken as a prisoner of war. Killed age 35 on the 27th of December 1944. Grave location – 3. E. 24. MISSING – Hit by falling bombs. HK576, F/O Pearson & crew, witnessed one such aircraft bombing from 23,000ft, that appeared to collide with a Lancaster flying alongside, which went down in a spin. It was later determined that NM710, F/O Miles and crew, was the aircraft going down out of control – possibly hit by falling bombs. Those who died were buried in the Rheinberg War Cemetery. Sgt. Robert Colin Legge, RCAF 64510 – Flight Engineer. Son of Percival J. and Alice H. Legge, of Renforth, New Brunswick, Canada. Grave location – Panel 186. Killed age 34 on the 25th of July 1944. Son Of James And Frances Leighton, Of Manchester; Husband Of Winifred Dorothy Leighton, Of Rusholme, Manchester. Sgt. 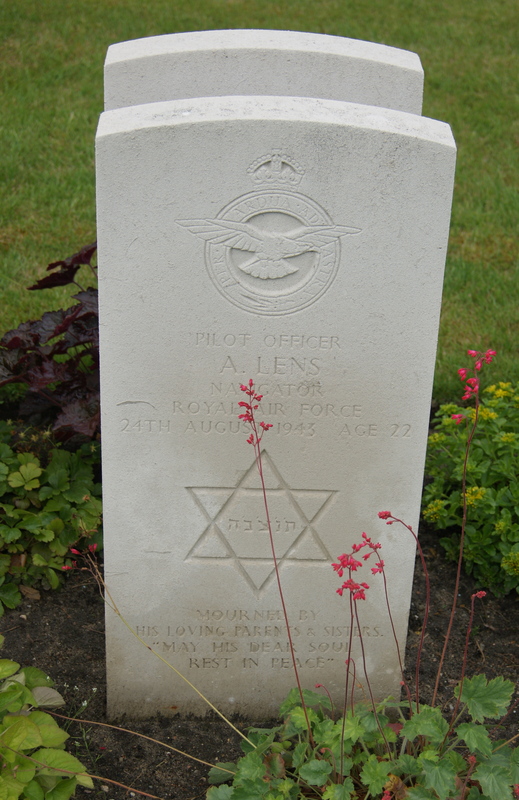 George Len Lennox, RAFVR 950013 – Flight Engineer. Lost without trace age 25 on the 28th of April 1943. Son of Eccles and Jeannie Lennox, of Glasgow. P/O Douglas Vincent Hamer, RAFVR 963403/ 141713 – Pilot. Sgt. Desmond Ray Ross, RNZAF NZ42341 – Navigator. Sgt. Ross Cameron Buckley, RNZAF NZ411206 – Air Bomber. Sgt. William Leslie Fred Brian, RNZAF NZ411737 – Wireless Operator. Sgt. Harry Pears Holme, RAFVR 1301281 – Mid Upper Gunner. Sgt. Malcolm Edward John Shogren, RNZAF NZ415375 – Rear Gunner. Stirling Mk.III BK664 AA-M was brought down by A/A fire from a Kreigsmarine (flak ship), battery MAA508, positioned between the Fehmarn-Belt and Lolland Island, in the Baltic. It crashed at 00:23hrs on the western side of Lolland Island and the crew all perished. The bodies of both air gunners were recovered and are buried in the Svino Churchyard. All other crew are commemorated on the Runnymede Memorial. P/O Aubrey Lens, RAFVR 149672 – Navigator. Son of John and Hetty Lens, of Brixton Hill, London. His loving parents & sisters. Sgt. 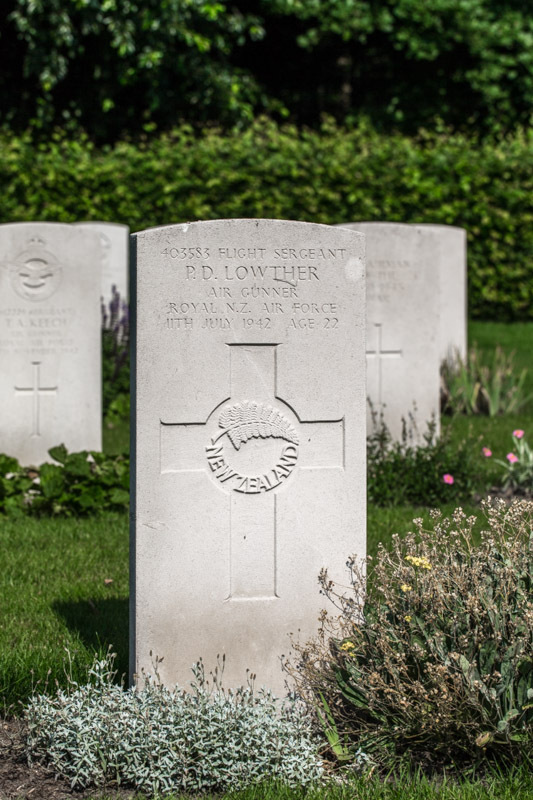 Edward John Letherbarrow, RAFVR 1315524 – Rear Gunner. Killed age 21 on the 11th of April 1943. Son of Thomas and Mildred Letherbarrow. Sgt. 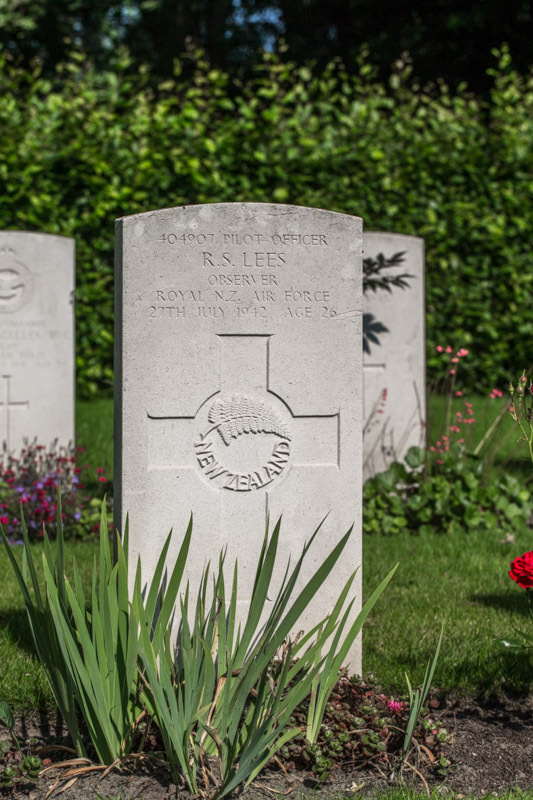 Sidney Joseph Lawrence Levack, RAFVR 971231 – Observer. Killed age 23 on the 22nd of October 1941. Son of Maud Levack, of Edinburgh. Grave location – Grave 166. Six Wellington aircraft from this Unit were detailed to carry out the above attacks. A mixed load was carried and consisted of 1000lbs, 500lbs, 250lbs and containers of incendiaries. Owing to the weather conditions operations were marred, but a fire was bombed in a town on the Rhine, probably Mannheim and bomb bursts seen. There was slight A.A. activity and searchlights were ineffective where seen. Electrical storms, thunder cloud and snow storms were met throughout operations. Navigation was good. D.R. and special beam No.6 used. Icing (black) was experienced over Continent. Unable to see through windscreens owing to accumulated snow, from Belgian coast onwards. Severe weather conditions made accuracy impossible. One of these aircraft, X.9914, captained by Sgt. Taylor, failed to return to base. Sgt. Cyril Taylor, RAFVR 110661 – Pilot. Sgt. Frederick Alexander Spark, RNZAF NZ401415 – 2nd Pilot. Sgt. James Roberts, RAAF AUS.400310 – Wireless Operator. Sgt. William Reid Steele, RAFVR 1051619 – Front Gunner. Sgt. Robert Holtby Tasker, RAFVR 1381172 – Rear Gunner. Wellington Mk.Ic X.9914 AA-M failed to return. It was later determined to have been brought down near Werken (West Vlaanderen) approximately 5ml East South East of Diksmuide, Belgium. There were no survivors. All were buried in Werken Chuchyard. Killed age 39 on the 21st of July 1944. Grave location – Plot B. Row 2. Grave 62. Lost without trace age 28 on the 6th of July 1943. Son of Owen and Annie Lewington; Husband of Gwendoline E.M. Lewington, of Henly-On-Thames, Oxfordshire. F/S Alfred Edward Lewis, RAAF AUS.412458 – Pilot. Son of Herbert and Mabel Jane Lewis, of Coolamon, New South Wales, Australia. Grave location – Panel 193. Lost without trace age 21 on the 21st of November 1944. Son of Millicent Lindsay, and Stepson of Arthur Bridge, of Bury, Lancashire. 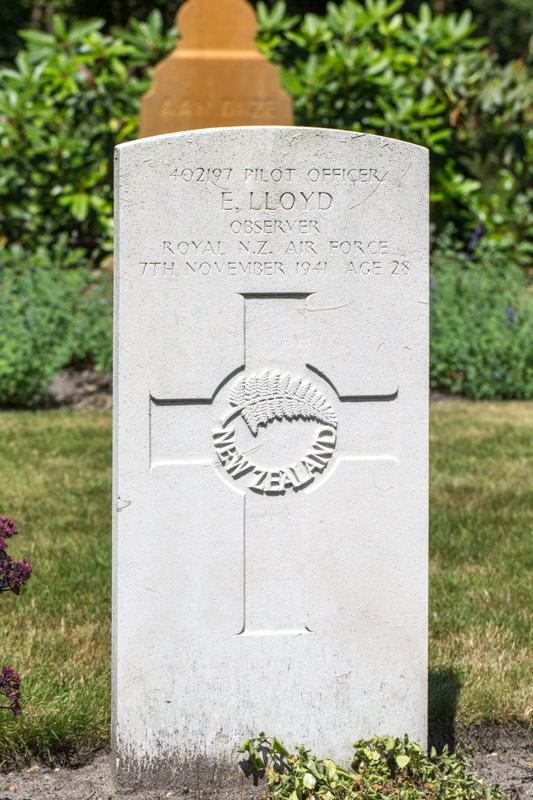 P/O Eric Lloyd, RNZAF NZ402197 – Observer. Killed age 28 on the 7th of November 1941. Son of Samuel Edgar Lloyd and of Lilian May Lloyd (Nee Toms), of Fordell, Wellington, New Zealand. Sgt. Alexander John Lock, RAFVR 928200 – Rear Gunner. Killed age 22 on the 11th of September 1942. Son of Thomas William and Maud Mary Lock. Grave location – Coll. grave 4. B. 3-19. Sgt. 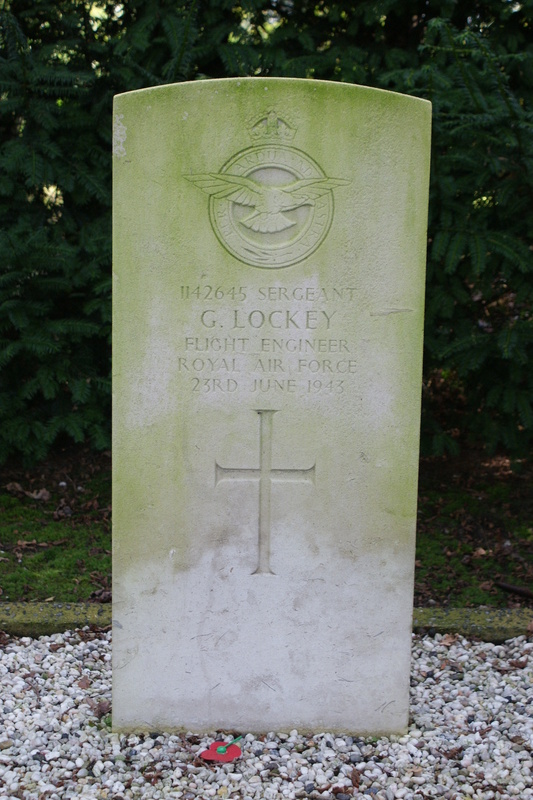 George Lockey, RAFVR 1142645 – Flight Engineer. Killed age 21 on the 23rd of June 1943. 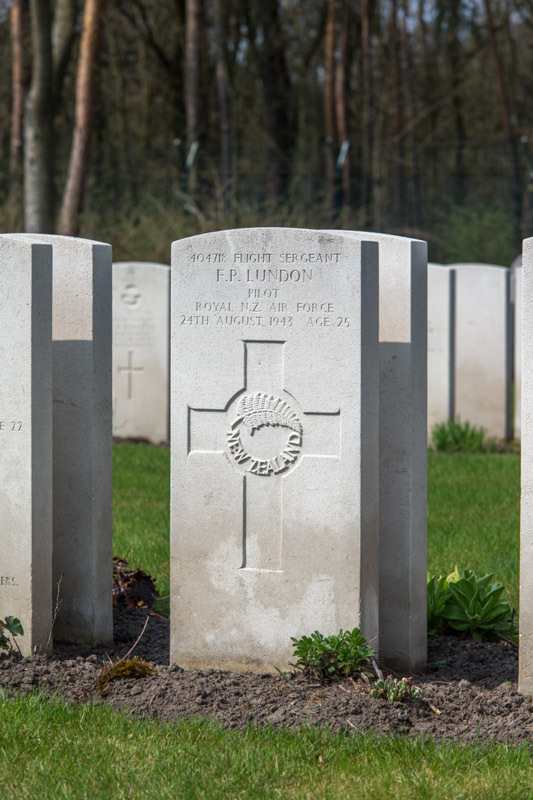 Buried Markelo General Cemetery, Holland. .
Fifteen aircraft were detailed to attack the above targets with incendiary bombs of 30lbs and 4lbs. Four aircraft failed to return and the remainder successfully dropped their bombs in the target area. Large concentrated fires and some explosions were seen the whole RUHR area was smoke palled. A very heavy A.A. barrage co-operating with searchlights was encountered and five aircraft were slightly hit by A.A. fire, some enemy aircraft were seen and three short combats took place, but no damage was sustained by our aircraft. There was 3/10ths cloud on the target area but visibility was fairly good, except for smoke haze. Navigation was very good. The missing aircraft were Stirling Mk.I EF399 captained by F/S Burbidge, Mk.III EF408 captained by Sgt. Wood, MK.III BK810 captained by W/O McKenzie and Mk.III EH889 captained by F/O McCrorie. F/S Kenneth Alfred Burbidge, RNZAF NZ412200 – Pilot. Sgt. Walter Frederick Wilcockson, RNZAF NZ42314 – Navigator. Sgt. Andrew James McEwen, RNZAF NZ417077 – Air Bomber. Sgt. Donald Ernest Martin, RNZAF NZ413872 – Wireless Operator. Sgt. Gibson Cameron, RAFVR 1304742 – Mid Upper Gunner. Sgt. Kenneth Fazackerley Shaw, RAFVR 1132866 – Rear Gunner. Stirling Mk.I EF399 AA-O was last heard from at 02:25hrs on a W/T message indicating the aircraft had been badly damaged by AA fire. Soon after, the Stirling was engaged by a night-fighter (Hptm Egmont Prinz zur LippeWeissendfeld, III./NJG1) and shot down at 02:47hrs near Markelo (Overjissel) 12 miles South West of Hengelo, Holland. All the deceased crew were buried in Markelo General Cemetery. F/O Tom Lodge, RNZAF NZ417284 – Navigator. Lost without trace age 35 on the 4th of November 1943. Son of Tom Lodge and of Rosaline Maude Lodge (Nee Wren); Husband of Jean Caroline Lodge, of Rotorua, Auckland, New Zealand. 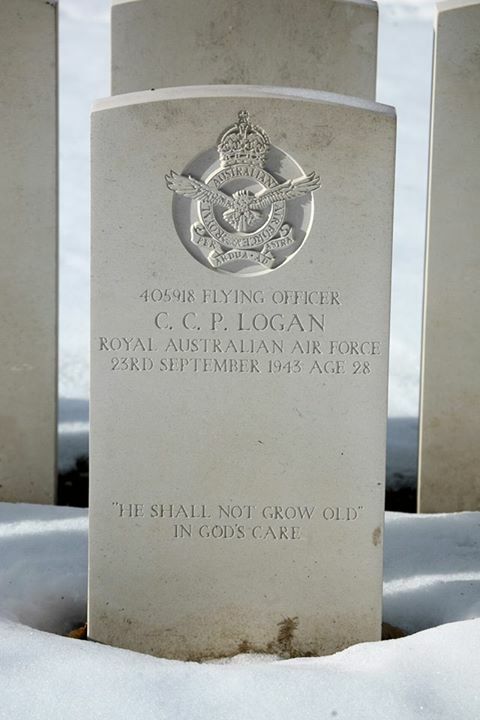 F/O Clifford Charles Pownall Logan, RAAF AUS.405918 – Pilot. Killed age 28 on the 23rd of September 1943. Son of Raymond Hough Logan and Agnes Eleanor Logan, of Corfield, Queensland, Australia. Son of Borisfield Swan Lombard and Marian Alice Lombard, of Markyate, Hertfordshire; Husband of Sybil Agnes Lombard. Sgt. Charles Albert Longstaff, RAFVR 1 595982 – Flight Engineer. Lost without trace age 31 on the 14th of March 1945. Son of Charles Henry and Mary Longstaff, of Middlesbrough, Yorkshire. Grave location – Panel 275. At 16.35hrs on the run up to the targetLancaster Mk.I PB741 AA-E, F/L Parsons & crew, was seen to have been hit by flak in the port-inner engine, which was then feathered. It also appeared to have been hit in the port-outer engine, which was feathered as the aircraft began descending quickly. Part of the wing caught fire and soon after, the complete wing broke off just as the Lancaster was diving through cloud. All on board were killed in the resultant crash. The flight engineer and air bomber have no known graves. The other five crew members are buried at the Reichswald Forest War Cemetery. Lost without trace age 26 on the 1st of September 1943. Son of John Edward Jones Lovelock and Ivy Evelyn Lovelock. Lost without trace age 21 on the 16th of August 1943. Son of Arthur and Ethel N. Lovewell, of Norwich. Grave location – Panel 157. F/O Harold Lowe, RAFVR 115129 – Wireless Operator. Killed age 23 on the 3rd of February 1943. Son of Harold and Priscilla Lowe, of Horsham, Sussex; Husband of Chrissie Lowe, of Horsham. Buried Amersfoort (Oud Leusden) General Cemetery, Holland.. Grave location – Plot 13. Row 13. Grave 213. P/O Kenneth Howard Blincoe, RNZAF NZ412194 – Pilot. Sgt. Andrew James Newell ‘Dougal’ Scott RNZAF NZ414685 – 2nd Pilot. Sgt. Frank Arthur Boese, RAFVR 1293282 – Navigator. Sgt. George Wood Cook, RNZAF NZ412514 – Air Bomber. P/O Harold Lowe, RAFVR 905609/ 115129 – Wireless Operator. Sgt. Desmond David Hayward, RAFVR 651764 – Flight Engineer. Sgt. Edward. McDermott, RCAF R.96960 – Mid Upper Gunner. Sgt. Desmond Clearwater, RNZAF NZ412314 – Rear Gunner. R.9280 was attacked by a German night-fighter over the Netherlands, while returning to base. The aircraft crashed at 20.00hrs in the vicinity of Ingen, 6miles NNE of Tiel, Hollnd. All on board were killed. They were buried in Amersfoort (Oud Leusden) General Cemetery. F/S Peter Desmond Lowther, RNZAF NZ403583 – Front Gunner. Killed age 22 on the 11th of July 1942. Son of George and Anna Maria Lowther, of Auckland City, New Zealand; Husband of Jean Lowther, of Devonport, Auckland. Grave location – 7. C. 13. Son of Robert William and May Maud Amelia Lowther, of Dagenham, Essex. Grave location – 18. E. 1. Sgt. Charles Lucas, RAFVR 1312083 – Mid Upper Gunner. Killed age 21 on the 17th of December 1942. Grave location – 17. A. 16. Sgt. George William Thomas Lucas, RAFVR 1250557 – Rear Gunner. Killed age 22 on the 1st of December 1943. Son of George and Ellen Francis May Lucas, of Shepherd’s Bush London. Buried St.Marylebone Cemetery, Finchley, Middlesex, England.. Grave location – Sec. W4. Grave 110. Three aircraft were detailed to carry out the above operation with mines of 1,500lb. Two of the aircraft successfully dropped their mines in the allotted area, but the parachutes were not seen to open owing to ten tenths cloud. Some heavy A.A. Fire was encountered, but caused negligible opposition. Visibility was poor in the mining area. Navigation was very good. On returning the aircraft captained by SGT. F/SGT.G.J.KERR crashed whilst attempting to land at R.A.F. Station ACKLINGTON. The aircraft crashed into a house and all of the crew were killed, except for the Mid Upper Gunner SGT. K.G.HOOK who was seriously injured. In addition to the crew, five children who were in the house were killed and their parents were admitted to Hospital. F/S George John Stewart Kerr, RAFVR 1558163 – Pilot. Sgt. Donald Frank Wort, RAFVR 1585034 – Navigator. Sgt. Ronald Smith, RAFVR 1239376 – Air Bomber. Sgt. Derek Arthur Holt, RAFVR 1217087 – Wireless Operator. Sgt. Leonard George Copsey, RAFVR 1691471 – Flight Engineer. Sgt. Kenneth Gordon Hook, RAFVR 1335989 – Mid Upper Gunner. Stirling Mk.III EH880 AA-J diverted to RAF Acklington on return from the above task and crashed into a house a short distance from the perimeter during a landing attempt at 22.40hrs. All of the crew were killed except the M/U gunner, Sgt K Hook, who was seriously injured. Five children in the family living in the house were killed. Their parents were pulled from the wreckage alive but badly injured. Killed age 23 on the 28th of May 1944. Son of Frederick Clark Lukey and of Ruby May Lukey (Nee Gaston), of Waikari, Canterbury, New Zealand. Killed age 25 on the 24th of August 1943. Son of David James Lundon and Catherine Lundon, of Pareora, Canterbury, New Zealand; Husband of Winifred Lundon.